The Department of Science and Technology (DST) is a department within the Ministry of Science and Technology in India and was established in May 1971, with the objective of promoting new areas of Science & Technology and to play a role of the nodal department for organising, coordinating and promoting S&T activities in the country. 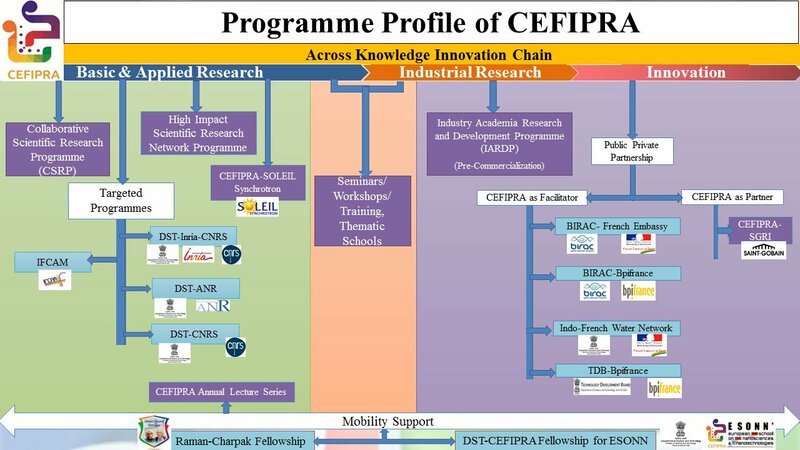 Indo-French Centre for the Promotion of Advanced Research (IFCPAR/CEFIPRA) is India’s first and France’s only bilateral organisation outside France which has been in existence for the past 30 years, committed to promote collaboration between the scientific communities of the two countries across the knowledge innovation chain. CEFIPRA along with DST has joined hands with Université Joseph Fourier (now Université Grenoble Alpes), Grenoble, France for supporting participation of Indian doctoral students to European School on Nano-sciences and Nano-technologies (ESONN) in Grenoble, France. ESONN is a three-week course aimed at providing training for graduate students, postdoctoral and junior scientists from universities and laboratories in the field of nano-sciences and nano-technologies in Physics, Biology and Chemistry. The academic and practical courses cover the elaboration, functioning and characterization of nano-objects. - ESONN Fees (Including boarding and lodging charges at ESONN).